This lawyer drawn agreement covers many critical corners of the law relating to loan agreements. It has been drawn to protect the Lender strongly. It provides for a guarantor but the option can be deleted if not required. We strongly advise a lender to insist on a guarantor. 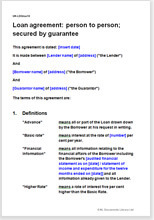 There is no provision for a company lender or borrower in this agreement, nor for additional security. If those are required, see the selection at Loan agreement templates. This is a simple but flexible agreement providing all the commonly required options. There is little statutory regulation relating to an agreement of this nature, so you can make more or less the deal you choose. Net Lawman offers a variety of documents. Choose the one which suit you best.